Unlike the cakes I made, which had multiple components, the cookies just have two components: milk crumb and cookie dough. You'll want to make the milk crumb first, since it will need to cool and set before being mixed into the cookie dough. The milk crumb is a simple mixture of milk powder, flour, cornstarch, sugar, and kosher salt bound with a little melted butter. You don't even need a mixer for it. You just combine everything with a spatula. As you mix, you'll see little clusters forming. That's when you know it's time to bake the crumb. After the crumb spends 20 minutes in a low oven, as Christina Tosi says, "Your kitchen should smell like buttery heaven," and you'll want to take the crumb out and let it cool. The other crumbs I made (birthday cake crumb and chocolate crumb) were done at this point, but the milk crumb requires just a little more. You have to toss the cooled crumb with more milk powder and then stir melted white chocolate into it. Here's the hardest part: Every 5 minutes, you have to give the crumb a little stir until the white chocolate hardens and the clusters lose their stickiness. That's not even hard, right? Once the butter, sugars, and glucose are creamed, you add the eggs and keep mixing. Add your milk crumb and then your dried blueberries on low speed, and the cookie dough is done. So easy. When the dough balls are good and chilled (at least 1 hour in the fridge), space them evenly on a Silpat-lined baking sheet (about 15 per sheet if you make minis). After the cookies cool briefly, sample devour them! Tosi describes them as "reminiscent of a blueberry muffin top (the best part of the muffin)" and that's definitely a spot-on description. They're filled with nostalgia, those all-too-familiar blueberry muffin flavors. The addition of milk crumb makes them almost like inside-out blueberry muffins, with that streusel-y crunch on the inside. And the cookies are super-chewy. Love. I was worried that the dried blueberries might not impart enough blueberry flavor, but these were honestly more packed with blueberry flavor than baked goods I've made with fresh blueberries. Have I convinced you that you need this cookbook yet? Or at least that you need to make these cookies?! 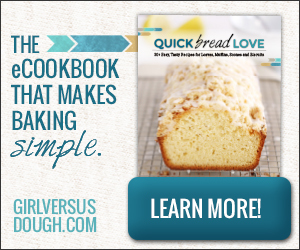 This post contains an Amazon affiliate link to a cookbook I love. If you follow the link to purchase the cookbook or make other purchases, I'll earn a few cents.